SIMMETHOD™ 7 laws of Best Practices, performance improvement, growth and value creation are used to analyze corporate performance, to create the competitive intelligence database and to convert data into ratios and ratios into industry agnostic risk and performance predictive indices that show strengths, weaknesses, threats and opportunities in relation to current and future competitors. SIMMETHOD™ blog "Converting Information into Assets" contains a large selection of case studies, graphical examples, articles and testimonials. 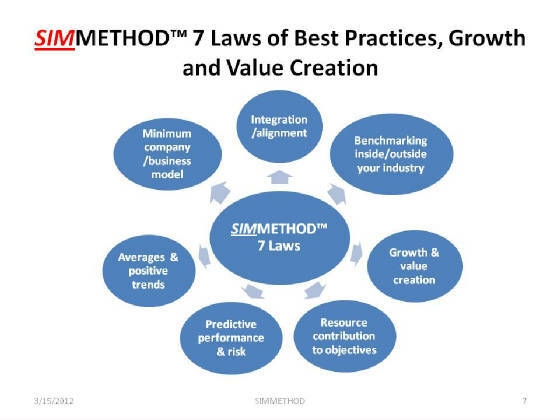 The SIMMETHOD™ 7 Laws of Best Practices, Growth and Value Creation provide a framework for the performance predictive algorithms, the calculation of the Strategy/Execution Performance Predictive Index and the identification and selection of the Best-In-Class businesses, leaders and management teams. In fact, through the analysis of 1000's of business and management metrics SIMMETHOD™ has identified a strong correlation between management's ability to strategize and execute against their peers including current and future competiors and their long term growth and value creation. In other words, there is a strong correlation beween a high score in the SIMMETHOD™ industry-agnostic indices that represent the resources where management has the greatest degree of control and long term growth and value creation.